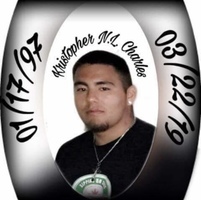 Provide comfort for the family of Kristopher Charles with a meaningful gesture of sympathy. It is with great sadness that we announce the sudden passing of Kristopher Nigel Lionel Charles, late of Prince Albert, SK, and formally of Grandmothers Bay, SK. Kristopher was born on January 17, 1997 in Prince Albert, SK, to parents: Paul O. Chris Charles and Shelly Ann Davidson. Kristopher will be lovingly remembered by his father: Paul O. Chris (Barbara) Charles; his sisters: Kayla Charles, Freda Charles, Melissa Charles and Kirsten Charles; his brothers: Kyle McKenzie (Christian), Nathan Charles, Mason Charles and Keestin Charles; his grandparents: Dave (Kim) Davidson, Maggie Charles and Donna Davidson; his special brother: Bryton Davidson; his great-great grandfather: John Lafond; his special cousin: Natasha Halkett (Garett Halkett); his nieces and nephews: Londyn McKenzie, Brooklyn McKenzie, Dakota McKenzie, Layton Halkett, Andi Halkett, Teesha Halkett and Tayah Halkett; his aunties: Sheryl Davidson, Emily (Henry) Charles, Martha (David) Charles, Loretta Davidson, June (Eric) Charles, Lynn Charles, Katelynn (Derek) Davidson, Nadine (Sheldon) Kolbelsky and Selena (Tyler) Badger; and his uncles: Stuart Davidson, Andrew Charles, David (Crystal) Davidson, Brandon Davidson, Andy Halkett and Soloman Charles. Kristopher was predeceased by his mother: Shelly Ann Davidson; his grandfather: Paul Charles; his uncles: Brad Davidson and Lionel Charles; his niece: Aireanah Halkett; and his nephew: Andre Halkett. A Wake Service will be held on Tuesday March 26, 2019 at the Allen Bird Gymnasium located in Prince Albert, SK. Another Wake Service will be held on Wednesday March 27, 2019 at 5:00PM located at St. Phillip’s Anglican Church located in Grandmothers Bay, SK. A Funeral Service will then be held on Thursday March 28, 2019 at 2:00PM located at St. Phillip’s Anglican Church in Grandmothers Bay, SK. Interment will follow at Grandmothers Bay Cemetery in Grandmothers Bay, SK. Arrangements in care of MacKenzie Chapel & Crematorium Brian and Bev Stobbs, Renée Phaneuf - Funeral Directors. www.MacKenzieChapel.ca 306.763.8488. To send flowers in memory of Kristopher Nigel Lionel Charles, please visit our Heartfelt Sympathies Store. We encourage you to share your most beloved memories of Kristopher here, so that the family and other loved ones can always see it. You can upload cherished photographs, or share your favorite stories, and can even comment on those shared by others.